A whole lot has happened this past weekend!! I got to hang out with my cousin and her daughter on Sunday, who is moving to Japan on Wednesday. She was living on the west coast so I only got to see her once a year, so now that she is moving across the world I’ll see her even less often. So it was incredible to have a full family good bye party and plotting how I’m going to afford a trip to Tokyo to go visit. I also went apartment hunting with my boyfriend all day Saturday, and I feel like we’re finally making some headway in finding a new place! Hopefully I can have my own mani-cave and filming room soon! And then a few more things that I can’t wait to share with you! Just the icing on my sweet-weekend-cake, Hare Polish had a restock on her Etsy store with a 10% off code! Needless to say, I stocked the launch time and grabbed a few that I’ve been wanting for ages! In honor of my new Hare polishes, I figured I had to show you guys one today! 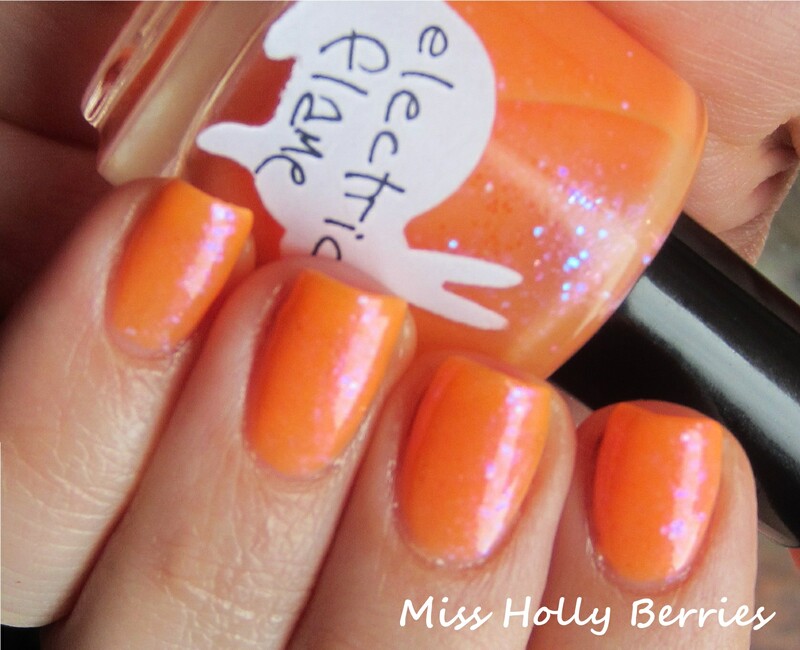 Hare Polish “Electric Flame” is a sheer coral jelly with iridescent blue glitter. The pictures don’t show this polish true to color. It is much more pink in real life. So while it looks more orange in the picture, my skin tone can pull this polish off. This polish is super sheer. This is 4 coats and I cant still see my visible nail line. Plus, the formula is a little bit thick. So while it takes 4 coats, it almost feels like there is 8 on my nails. It takes a while to dry as well. I think this polish is going to be reserved for layering only, and I now have so many ideas floating around in my head. I wonder how this would look over neon pink!? What do you guys think? Did any of you pick up any new Hare Polishes in the restock? I love orange (and pink), this is definitely on my wish list now. this would look awesome on you too!! do you like orange polish?